In recent years, the idea of downsizing to a home that everyone can afford to live in has spawned what is now known as the “tiny house movement”. Also called the “small house movement” can easily be described as a social movement that advocates living in houses smaller than 1,000 square feet. Tiny houses have quickly become a popular housing alternative to Millennials living alone or without children. Nevertheless, they say what has been will be again and what has been done will be done again. This pretty much describes the Tiny House Movement. Whether we want to call them tiny, small or micro housing, this style of housing has been with us for well over a century. This is evident in cities, such as Jacksonville, that witnessed significant population growth and urbanization during the American Industrial Revolution. During those days, the shotgun house became the solution to providing quick affordable housing in the vicinity of railroad, maritime and manufacturing hubs. Serving a similar purpose to the rowhouse in Northeastern cities, the shotgun was the most popular style of housing in the Southern United States from the end of the American Civil War through the Great Depression. Shotgun houses facing the former rail line separating the Eastside and Springfield during the 1970s. Designed to provide a solution to urban overcrowding, shotgun houses were often built as rental properties near manufacturing centers and railroad hubs to provide affordable housing for workers. Shotgun houses tended to be narrow across the front in order to maximize the number of units on each residential lot. Running deep on the lot, rooms were typically arranged one behind the other connected by a long hallway. Because this long hall usually ran the entire length of the house, the name derived from the possibility of firing a round from the front door through the back door without hitting any part of the house. Many scholars believe shotgun houses reflect African building traditions that entered the American Southeast via the transatlantic slave trade through the Caribbean Islands, starting in New Orleans and brought to cities like Jacksonville by migrating Black freedmen. In Jacksonville, the typical shotgun house could be characterized as being of frame construction, 14’ to 15’ in width, with a metal gable or hip roof. With the city’s population increasing 103% between 1900 and 1910 and 59% between 1910 and 1920, the typical shotgun featured little to no ornamentation, offering less than 800 square feet of enclosed floor area. 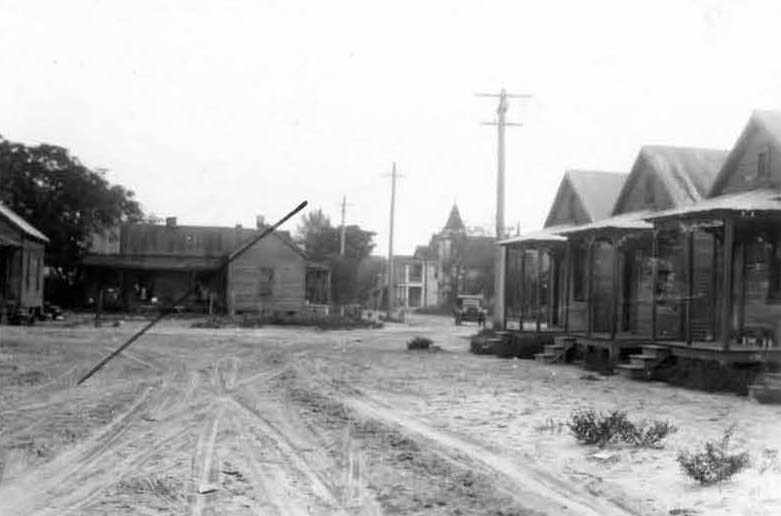 By the end of the Florida Land Boom, shotguns dominated the streets of working class African-American neighborhoods near Jacksonville railroad centers such as Hansontown, Campbell Hill, Lavilla, Brooklyn, Oakland (Eastside), Campbells Addition (Eastside) and Durkeeville. 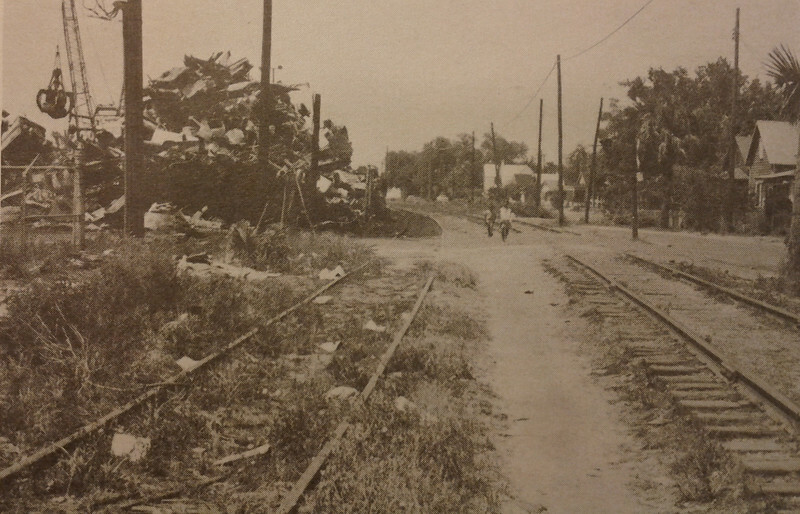 Intersection of Franklin Street and 1st Street in the Eastside in 1928. Shotgun construction spiked again in Jacksonville’s Eastside during World War II as a workforce housing solution for the St. Johns River Shipbuilding Company. Beginning operations with an initial workforce of 258 in April 1942, employment rapidly increased to 20,000 by 1944, as the shipyard built liberty ships for the war effort. In Jacksonville, the construction of thousands of shotgun housing units through World War II led the city’s population density maxing out at nearly 7,000 residents per square mile by the 1950 census. However, by this time, the shotgun’s key advantages had become obsolete to home buyers due to increased affordability of the car and air conditions. Since the 1950 census Jacksonville’s urban core has lost 50% of its population and density. Much of this loss can be equated to the massive demolition of shotgun housing districts over the last few decades. Once seen as a solution to urban overcrowding, following the end of World War II, the shotgun had become a symbol of blight and neighborhoods dominated with this housing style became prime targets for urban renewal initiatives.